Product prices and availability are accurate as of 2019-04-20 17:38:12 UTC and are subject to change. Any price and availability information displayed on http://www.amazon.com/ at the time of purchase will apply to the purchase of this product. This fully-loaded, complete kit has everything your beginner needs to start fishing. 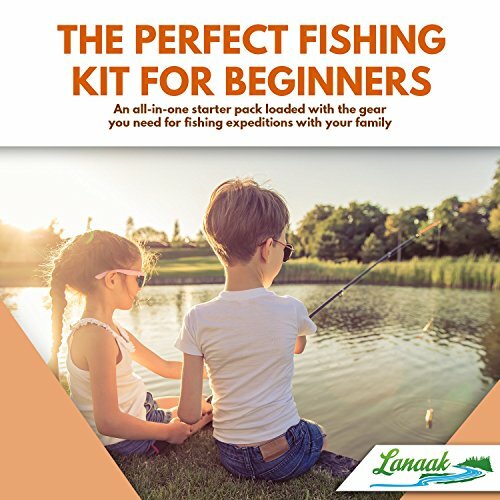 Looking for the perfect gift for a young fishing enthusiast or a surprise for a first fishing expedition with the family? Get everything they need for their first big catch in one high-quality, easy-to-use kit. 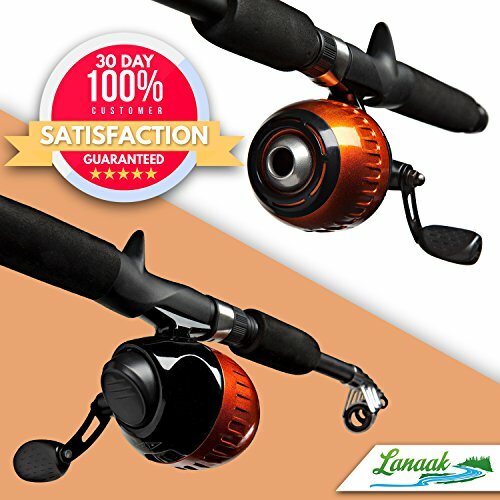 The telescoping fishing rod is easy to carry, because it collapses to 17 inches. And it's great for a variety of ages, as it expands to 65 inches. The closed-face, spincast reel arrives pre-spooled with 200 feet of 8-lb test line, and the push button casting system makes casting easy for everyone. The kit includes a tackle box stocked with hooks, bobbers, sinkers, swivels, plastic worms and a crankbait lure. No further shopping needed! Because you can't catch fish without bait, we include a hand net to provide an endless supply of minnows and nonstop entertainment (even if the fish aren't biting). Everything stores neatly in the carry bag which fits in a backpack or under the seat of your car. Great for fishing trips that involve hiking and camping, too! We want your fishing trip to be a fun, stress-free success, so we include our Lanaak Fishing Starter Guide. 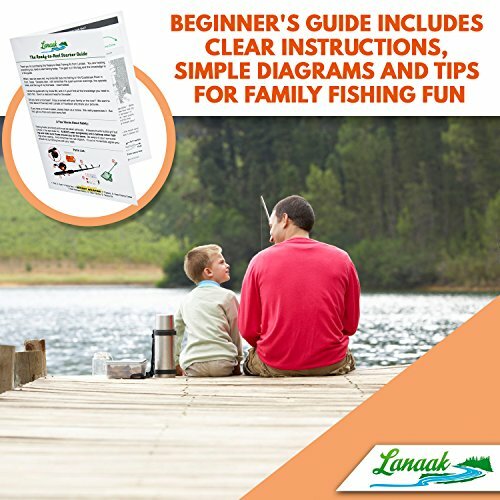 It delivers clear explanations, easy-to-read diagrams, and a few tips and tricks for fishing with a family. Plus, watch for links to our instructional videos! We offer a 30 Day Money Back Guarantee. In the unlikely event that you are not satisfied, contact us for a replacement or return it for a full refund. Gear up for family adventure and life-long memories! 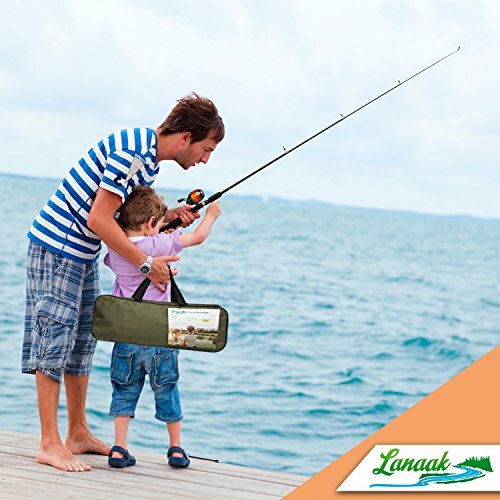 Add the Lanaak Fishing Kit to your cart today! 37 PIECE FISHING GEAR KIT includes: 65 inch telescopic fishing rod; spincast reel; tackle box stocked with gear; minnow net; beginner's guide; and carry case. 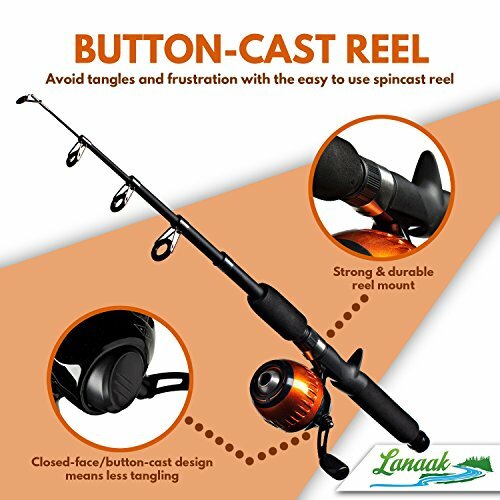 EASY TO CAST reel features push-button design. Reel arrives pre-spooled, no assembly needed. LOADED TACKLE BOX comes with 2 floating bobbers; 10 hooks; 10 split sinkers; 10 swivels; 2 jig heads; 6 plastic worms; and 1 crankbait lure. 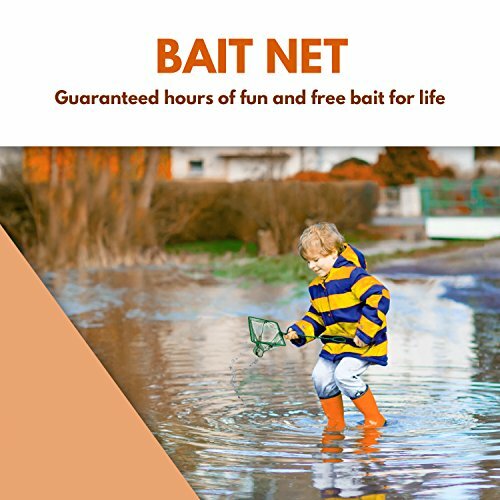 BAIT NET provides endless fun. Skip the bait shop, and watch as they entertain themselves chasing crickets and minnows! CARRY BAG INCLUDED for storage and travel. This whole kit fits under a car seat or in a backpack. Gear up for an outdoor adventure today!